Sea Shell at Sunset Cottages - Marvelous May Nights Still Available - Book Now! To Book a Stay click "Request to Book" or To Inquire about booking a stay click "Ask Owner a Question". SEASONALLY HEATED OUTDOOR POOL !! I strive to provide the best stay at the best value for all my guests. Let me book a great stay for you! Take a moment to READ OUR 250+ OUTSTANDING GUEST REVIEWS!! They say it all! BEACH SERVICE INCLUDED March 1st thru October 31st ! Beach Umbrella & 2 Chairs Already Setup at the beach for you!! Just Check In & Relax! Wireless Internet!!! Bring your laptop and Surf the Web while at the Sea Shell!! COX Contour TV System with On Demand Movies, Television Shows, and DVR! 49" Wall Mounted SMART TV!! You can Login to your own Netflix, Amazon, or Hulu Account! Summer Reservations Require a SATURDAY ARRIVAL DATE and a SATURDAY DEPARTURE DATE, ONLY 7 or 14 NIGHT STAYS. Only Reservations abiding by these preferences will be accepted. Thank You. Voted many years running as Southern Living Readers' Choice Award for Best Beach Town and Family Vacation!! Voted Top/Best/#1 Beach by USA Today, Family Fun Magazine !! The Sea Shell condo is located in the cozy 19 unit Sunset Cottages complex on Okaloosa Island in Fort Walton Beach, Florida. It is “Gulf Side”, just over 200 steps from the sand, so no roads to cross and you can be relaxing on the beach in minutes! The Sea Shell has a 2nd floor partial gulf view from the dining room window and great room balcony. Inside there is a spacious 750 sq.ft. for you to lounge and relax which includes; large great room, large bedroom and bath, condo complex built in 2000. The décor reminds you of the soft relaxing colors of the sand and sea, and of course Sea Shells. The large great room includes a spacious fully equipped kitchen, dining area with a dining table that seats up to 6 people, and living area. The living area includes a queen-size sleeper sofa, love seat, 49'' Wall Mounted SMART TV with full cable with COX Contour DVR/On Demand System, dvd/vcr player, and over one hundred movies for all ages to watch. The great room has two large windows and french doors opening onto a second balcony with a partial view of the Gulf of Mexico. The large bedroom has its own private additional entrance to the bathroom, its own private balcony, a king-size bed with a new amazing comfortable plush/pillow-top mattress, 32" HDTV, DVD player and full cable. There is a spacious hallway with built-in twin bunk beds with sliding curtains for more privacy for the anyone sleeping in the bunk area. The condo can sleep up to six people. The unit is equipped with washer, dryer, blow dryer, ironing board, and iron. Many other basic supplies are provided for your comfort and convenience. The Sunset Cottages complex has a private seasonally heated pool, pool area restrooms, outside shower, and a large deck area with two built-in grills for chillin and grillin. The Sea Shell is located less than 10 miles from both Eglin and Hurlburt Air Force Bases. The Northwest Florida Regional Airport is just 11 miles away and Pensacola Gulf Coast Regional Airport is 47 miles away from the Sea Shell. Best of all the condo is located just minutes away from great family entertainment including: amusement parks, boating excursions, charter fishing, Okaloosa Island Fishing Pier, golf, go-carts, The Gulfaruim, mini-golf, parasailing, Silver Sands Outlet Mall, scuba and snorkeling, watercraft rentals, Big Kahuna's Water Park and some of the best restaurants and seafood anywhere! We constantly strive to make the Sea Shell Your best ever Vacation Home!! I have been coming to Florida's Emerald Coast since I was a child (40+ yrs) and I truly believe these are the most beautiful beaches in the USA!! The emerald clear water, sugar white sand, amazing attractions, and beach bathing make it the perfect vacation spot for my family and hopefully yours!! Since October 2004 I have owned a piece of this paradise, the Sea Shell. From the moment I bought the Sea Shell my goal was to make it the best vacation destination on Okaloosa Island. I constantly strive to provide outstanding guest service and the best vacation home. I want you to come back time and time again. Since October 2004 I have had the privilege of providing an outstanding vacation destination to a thousands of guests. Just read our outstanding reviews, they speak for themselves! Great Location, Family Friendly, Beautiful Beaches! Bathroom accessible from hallway and bedroom. Shower and tub combination with multi-spray shower head. Partial Gulf View from windows and balconies. Bathroom Towels, but Not Beach Towels. Free WiFi Cox High Speed Wireless Internet. Bring your pc and surf the Web!! GE Dishwasher with all the bells and whistles. Fully equipped kitchen. Everything you could possibly need to create a gourmet meal. Wall Mounted 49'' SMART TV w/ DVD/VCR/Cable in Great Room & 32'' HDTV w/ DVD/Cable in Bedroom. COX Contour System with talking Remote and DVR, On Demand Movies. (2) Full HD Cable in both Living Room and Bedroom. COX Contour Advanced System with Talking Remote/DVR/On Demand Movies, plus with SMART TV you can Login to your own Nexflix Acct. (2) One large balcony w/ Gulf Views off the great room and one smaller balcony w/ Gulf Views off the bedroom. Sea Kayaks available for rent from the beach service out on the beach. Please note this is NOT INCLUDED in the beach service that we do provide. Nice paved patio inside the shared pool area to relax and BBQ with 2 large tables and plenty of seating. Paddle Boards available for rent from the beach service out on the beach. Please note this is NOT INCLUDED in the beach service that we do provide. Heated Pool in middle of complex. Down the steps from front door. Lounge chairs, chairs, and tables inside the condo pool area. Pool is heated based on outdoor temperature and complex occupancy. Beach Service Included for stays between March 1st through October 31st - Large Umbrella & 2 Beach Chairs - Setup at the Beach for you!! Condo community pool is seasonally heated. Sea Shell cottage was perfect for my daughter and me. It was extremely clean (I am very picky) and the decor was lovely and relaxing. I'm a sucker for comfy linens and a good bed, and I was lucky to get both. The cottage was plenty roomy and had all the accommodations we needed; very well thought out. Even my fussy, moody, teenager said no less than 3 times "This place is perfect!" 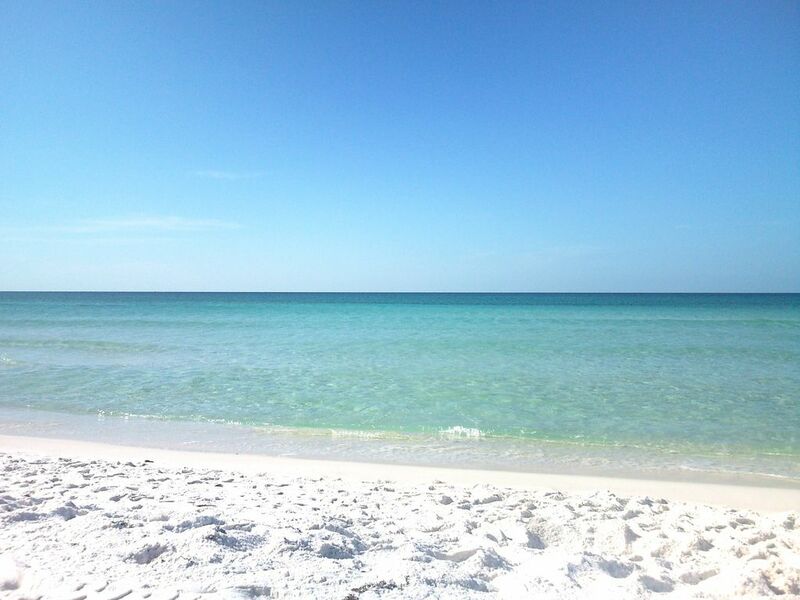 The location is excellent, even on gorgeous Okaloosa Island. I liked being near the end of the Island. The beach seemed closer and it was quieter. I relished my morning coffee and down time at the end of each busy day on one of the 2 balconies. It was peaceful and serene even though we were only 1.5 miles away from so many delicious restaurants and touristy shops. It is the best of both worlds. Lisa and family, thank you for letting us stay in your lovely home. My golden rule of a perfect vacation is to find a base of operations that feels like home. If you find that, your vacation will be successful. Your condo not only felt like home, but you knocked it out of the ballpark with all the thoughtful attentions to comfort. You will definitely hear from us again next year. The place was very nice. Easy access and having a washer/dryer was definitely a plus. Close to grocery store, shopping & restaurants. Plenty to do even on cold ray days . So glad you enjoyed the convenient location of the Sea Shell to all the amenities guests need during a stay. I love Okaloosa Island/Fort Walton Beach. It is beautiful and not as crowded as Destin, yet close to everything you really need. Also having the amenities inside the condo, such as a washer/dryer does make a stay that much more convenient. Please come back and stay with us again. Very clean and owner so friendly, she wants your stay to be the best, great customer service!! Thank you for noticing the amazing job our housekeepers do of keeping the Sea Shell in pristine condition!! I was a pleasure having you as guests. My goal is always to provide the best customer/guest service to you and all my guests!! I am so thrilled you felt I accomplished that for you. We really enjoyed the sea shell condo! Perfect for our family of 6! Hope to be back soon!! I am so glad you found the Sea Shell to be perfect for your family and that you really enjoyed your stay!! I always strive to provide a great vacation destination for you and all my guests Please come back and stay with us again!! It was the perfect place for our first visit to Ft Walton. Beautiful place to stay was very close to the beach and many restaurants just down the road. My husband loved it although the weather didn’t cooperate we were still able to find enough stuff to do. The first day we sat on the beach we were able to watch dolphins swimming across the Ocean and enjoyed the quietness of the beach . We have always gone to Myrtle Beach but this was without a doubt the most beautiful beach we have ever saw. The beautiful white sand and the emerald waters what more could a person want. If we ever get another chance we will surly go to the Sea Shell. I am so glad you loved your first visit to Fort Walton Beach and your stay at the Sea Shell. I agree with you, we do have the most beautiful white sand and emerald waters I have ever seen. Please do come back and stay with us again. To Book your Stay Requires: 1) 25 years old minimum age 2) Completed/Signed Rental Agreement 3) Copy of Photo ID 4) $300.00 First Payment of Total Rental Amount 5) Balance of Total Rental Amount due 60 Days Prior to Check In Date along with $250.00 Refundable Damage Deposit Credit Cards and EChecks both accepted methods of payment. Stays of 21 Nights or longer the Cleaning Fee is $165.00, instead of $110.00. Stays of 21 Nights or longer the Sheets & Towels are swapped every 14 Days. Summer stays require a 7 Night Stay with a Saturday Check In and a Saturday Check Out. Summer stays can be either 7 nights or 14 Nights, with a Saturday Check In and Saturday Check Out. Damage Deposit, less any damage charges that might be incurred after condo is inspected, is refunded to you within 10 Business Days. It is refunded to your credit card or checking account if paid with ECheck.